It is up to you to decide if you want to require users to authenticate in to your mobile file on their iOS device. Many users will choose to use an auto-enter account and password so local users won't be asked to authenticate each time they open the mobile file. This makes more sense in synced files than others because a) the file often doesn't have any/much data in it, b) you can instruct users to secure the device with strong passwords, instead of securing the file, and c) the local file has no account information (no access) for the hosted files. If you're concerned about theft of the mobile device, check out the Remote Wipe available here: http://www.apple.com/ipad/built-in-apps/find-my-ipad.html Note that you can also turn off "simple passcodes" in your iPhone or iPad's settings to use longer, more secure device passwords. After downloading new data from the server. After downloading a new version of the mobile file. and After sending a batch of records to the server. Users will also be asked to authenticate each time they return to an open local file (such as after switching away to another app, or after closing their iPad) unless you use the fmreauthenticate extended privilege to control when users will be required to reauthenticate after not using FileMaker Go for a specified period of time. You'll likely want to add this to the privilege set in effect on your iOS Devices. So here are our recommendations for securing your mobile files (you can do this to GoZyncMobile as well if you wish). Secure your iOS device with a passcode. Create an upon opening script in your file that uses Get ( ApplicationVersion ) to test if the user is on FMGo or FMPro. Run this script with Allow User Abort Off. If they are on Pro, call the relogin script step with NO options so they need an account to use the file. If they are on Go, call the relogin script step using an account that lets them do their work but is NOT shared with the hosted solution. Use the fmreauthenticate extended privilege to control when users will be required to reauthenticate after not using FileMaker Go for a specified period of time. The number after fmreauthenticate indicates how long, in minutes, the user can go inactive without having to reauthenticate: fmreauthenticate0 means they would have to reauthenticate every time they come back; fmreauthenticate120 would let them stay away 2 hours before they'd have to log in again. See FileMaker's Go Development Guide for more details. When it comes to your hosted files, GoZyncMobile will open your hosted solution (your "mothership" files) at the beginning of a sync session. This is when users will be asked to log into your solution. You really don't need to secure your files any differently than you do now: syncing users will be asked to authenticate when they sync begins and if their login fails the sync will abort. GoZyncHosted doesn't have any file references to your hosted solution (your "mothership" files) but it does contain your configuration instructions, so you don't want just any user messing around in there. We've created two privilege sets in GoZyncHosted: "Admin" and "Sync". Admin is a full access privilege set and "Sync" is a lower level access that lets users sync but not change the sync settings. 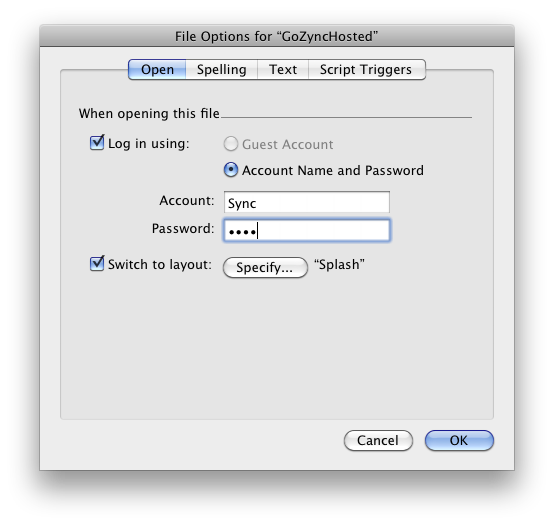 We recommend you default GoZyncHosted to the sync privilege set, and then log in as an admin user when you want to make changes to the sync settings. Then, when you need to log in as an admin user, run the "Relogin" script from GoZyncHosted and enter your Admin account and password. You'll find this "Sync" privilege set in GoZyncMobile as well so if you log GoZyncMobile in using "Sync" in your Upon Opening script AND GoZyncMobile and GoZyncHosted have the same account name and password for the "Sync" privilege set, you can turn off the File Options account in GoZyncHosted. That is idea. GoZyncMobile (GZM) uses logs into the Sync privilege set via your Upon Opening script when it is opened on iOS. If GZH is opened by something other than GZM, users will be asked to log in. If GZM is opened off of an iOS device, users will be asked to log in. ALL users will be asked to log in to your hosted files at the beginning of the sync. You'll likely want to switch the default Full Access account fro both GZM and GZH from Admin / blank which is the FileMaker default for admin accounts and a bit easy to guess.